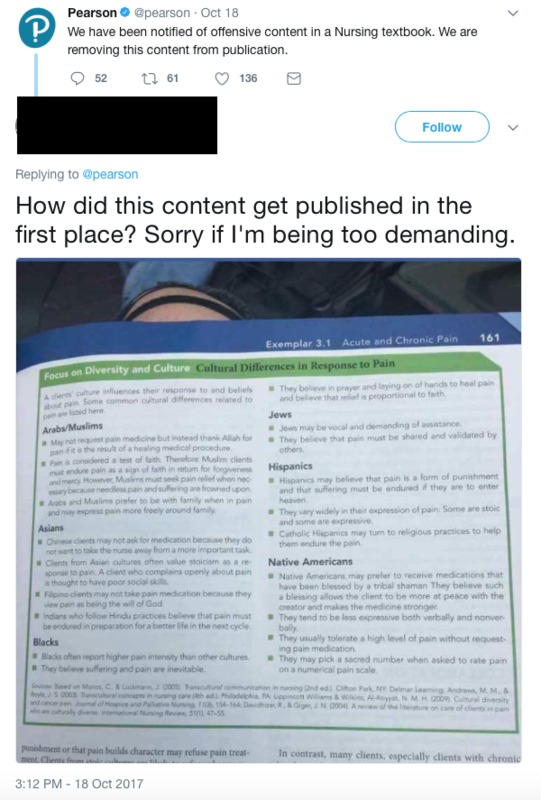 A Pearson textbook Nursing: A Context Based Approach to Learning (reportedly published in 2014) has become a point of controversy after an outpouring of outrage over the culturally stereotyped discussion of “Cultural Differences in Response to Pain.” The publisher has apologized, is studying how this chart passed editorial review, and has “removed the material in question from current versions of the book.” Noting how essentialized descriptions in a 2014 textbook only comes to attention now makes one wonder how many people, particularly educators and editors, viewed this chart and thought nothing of it. Though many of us continue to hope that people would be more aware of the problem of stereotypes and generalized assertions, much of what we teach in Religious Studies about critical thinking, categorization, and the problems of essentialization remains vitally important, but sometimes we have to remind ourselves of the dangers of generalizing, too. In the chart (picture reproduced above), cultural attitudes towards pain reinforced particular negative stereotypes of minority communities. For example, the chart asserts, “Jews may be vocal and demanding of assistance,” and “Blacks often report higher pain intensity than other cultures.” Both of those assertions could be significantly prejudicial, as some medical professional might not take seriously the assertions of patients whom the medical professional identifies with groups that complain more about pain. While those statements have some qualification of the generality with the terms “may” and “often,” some other statements in the chart are worse, declaring, “Indians who follow Hindu practices believe that pain must be endured in preparation for a better life in the next cycle,” and “Pain is considered a test of faith. Therefore Muslim clients must endure pain as a sign of faith in return for forgiveness and mercy. However, Muslims must seek pain relief when necessary because needless pain and suffering are frowned upon.” Beyond the internal contradiction in the second statement that leaves me scratching my head, these generalized statements not only fail to include any qualification of the generalizations but also assume that an idealized belief determines actions, specifically responses to pain. Seeing such generalizations in an authoritative source like a textbook reinforce the marginalization and discrimination that some people experience, beyond the issue of potentially hampering pain management for some. That said, the response to this controversy from some friends has been to suggest that medical personnel need a good religious studies course that challenges stereotypes and demonstrates the complexity of interpretations and the variety of practices. While that was my initial reaction, I talked with some current nursing students (both an undergraduate and a graduate student) who demonstrate that the generalization of medical personnel as out-of-touch is itself a problematic generalization. While one of the two was tested on material similar to this, the other was presented the material with considerably more nuance than the textbook suggests. Moreover, the other applied an individualized approach to pain management, recognizing that each individual patient’s response to pain may reflect particular individual and familial backgrounds as well as cultural norms (that the individual may accept or reject). While I would like to think that this nurse’s background in the humanities contributed to this nuanced approach, it also seems that norms of coworkers also contributed to this approach. In other words, medical personnel have a range of attitudes towards cultural difference and often recognize the individual nature of responses to pain that this textbook chart ignores when discussing other cultures. It is hard to imagine the failure of authors and editors to reflect on cultural diversity in such a problematic manner, yet the textbook generalizations should not become the occasion for negative generalizations about medical personnel. Thanks to our M.A. student Sierra Lawson for bringing this issue to my attention. Have I mentioned that we have great students and graduates! This entry was posted in Faculty Blog, Relevance of Humanities, Religion in Culture and tagged Belief, Cultural Diversity, Generalizations, Nursing, Pain, practice, stereotypes by Steven Ramey. Bookmark the permalink.